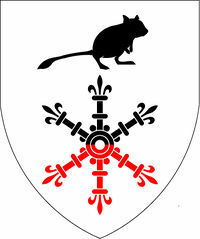 Argent, an escarbuncle of six arms per fess sable and gules and in chief a mouse statant sable. Born after a Mongol invasion in the 11th century Mika started out in the Carpathian mountains but has been traveling in an eastward direction ever since. 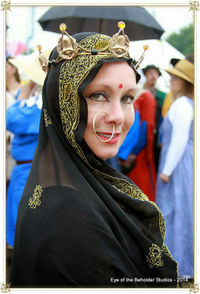 Currently in India she continues to study the arts and cultures of the vast continent. She earns a living through service to the kingdom, through her art, and endless energy. I am in the kitchen and helping out whenever possible. Need to keep busy to stay out of trouble! This page was last edited on 16 April 2018, at 19:44.